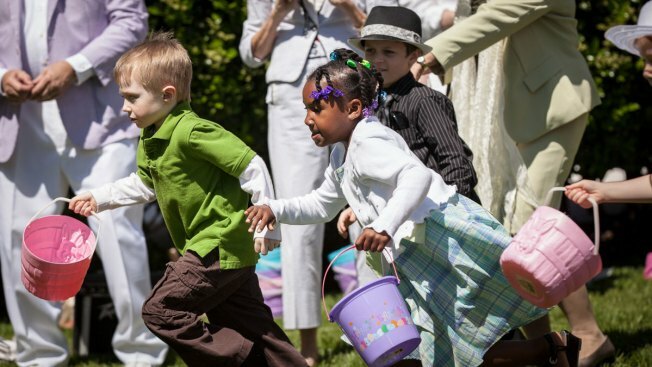 Children rush from the starting line during an Easter egg hunt. Pastel-colored eggs camouflaged by spring-green grass can be difficult to find. Luckily, Easter egg hunts themselves are far from hidden in D.C., Maryland and Virginia. Easter falls on Sunday, April 5 this year, but spots in D.C., Maryland and Virginia will host Easter egg hunts spanning from March 28 to April 12. Most hunts are coupled with other springtime, family-fun activities like face-painting, raffles, live animals (including "Easter" bunnies!) and hayrides, to name a few. Missed the online lottery to secure a spot at the president's White House Easter Egg Roll? Madame Tussauds has the next best thing -- a giant Easter egg hunt through the museum with all 44 (wax) presidents! After the egg hunt in the Presidents Gallery, participants can collect a gift bag, meet the Easter bunny and live animals, and join in on craft activities. Admission is free for children ages 12 and younger, and $25 for ages 13 and up. Order tickets online here. When: Saturday, April 4, 7:30-9:30 a.m.
Go search for the 11,000 eggs hidden in the park! Additional (free) perks include a life-size Easter bunny, cotton candy, face painting, a bike raffle, and other games and prizes. When: Saturday, April 4, 1-3 p.m. Snap pictures with the Easter bunny, hunt for hidden eggs, enjoy an egg roll contest, and decorate bunny masks at D.C.'s scenic Tudor Place! Make sure to bring a basket, spoon and hard-boiled egg. Register and read more information here. Kids ages 2 to 12 can hunt for hard-boiled eggs, and for an artistic twist, decorate them! Other activities include bunny hat and frog puppet crafts, and a meet-and-greet with live animals. Admission is $8 per child. When: Friday, April 3, 10 a.m.-3 p.m.
Head to Butler's Orchard for the 20th annual Bunnyland! Bunnyland puts a fun spin on the traditional egg hunt by also offering a hayride down the bunny trail, a visit with the farm's Country Bunny, and a playground with inflatables and giant slides. Admission is $8.75 for children and $6.75 for adults. More information here. When: March 28-29, April 3-4, 6, 10-12, 9 a.m.-4 p.m.
Maryland’s B&O Railroad Museum once again has a special treat for the Easter holiday. Join in the fun with the museum's annual breakfast buffet, story time, indoor carousel rides and an exciting train ride with the B&O Bunny! Ticket information here. When: April 3-4, 8:30-9:30 a.m. Cheers to the 16th annual Lee-Fendall House Easter Egg Hunt! Activities include a massive hunt for hundreds of colorful eggs, crafts, games, photos with the Easter bunny, and refreshments. Tickets are $12 for kids ages 12 and under, and $5 for visitors 13 and up. NOTE: Time slots are now sold out, but available spots will be sold on a first-come, first-served basis in the event of no-shows. More information here. When: April 3-5, 3 p.m.
"Don’t tell any bunny," but Ticonderoga Farm is hosting an all-out Easter bash. Eggs-traordinary events include farm animals, face painting, hayrides, a farm market, a bamboo maze, giant slides and more. Cost is $12.95 per person. Additional information here. When: March 28-29, April 4-5; egg hunts at 11 a.m. and 2 p.m.
Where: 26469 Ticonderoga Road, Chantilly, Va. The Easter bunny is attending this eggstravaganza -- are you? For free, visitors can join the Easter egg hunt, as well as meet the Easter bunny, pet animals, paint faces, break a pinata, and enter a bike raffle. When: Saturday, March 28, 11 a.m.-2 p.m. Yes, indulging in candy is a time-honored Easter tradition. But Morven Park's Easter event offers a health-conscious twist. Eco-friendly activities include natural egg dying and learning about healthy Easter treats. Tickets are $10 for adults and $5 for children.